Tactics Ogre: Let Us Cling Together (タクティクスオウガ, Takutikusu Ōga?) is a Japanese tactical role-playing game created by Quest Corporation. The game was originally released in 1995 on the Super Famicom in Japan and then re-released on the Sega Saturn in 1996 and the PlayStation in 1997. The first game in the series, Ogre Battle: March of the Black Queen, also appeared on these consoles, but featured dramatically different gameplay. The subtitle of Tactics Ogre, Let Us Cling Together, is a reference to the Queen song Teo Torriatte (Let Us Cling Together) from their album A Day at the Races. This is one of many references to Queen songs in the series, including Ogre Battle: March of the Black Queen, which references "Ogre Battle" and "The March of the Black Queen". A remake of the game by the original development team was announced in the July 22, 2010 issue of Weekly Famitsu for the PSP with the new title Tactics Ogre: Unmei no Wa (タクティクスオウガ 運命の輪, Tactics Ogre: Unmei no Wa? lit. "Tactics Ogre: The Wheel of Fortune"). The game was also confirmed for North American and PAL region releases, under its original title Tactics Ogre: Let Us Cling Together. The Game Boy Advance game is set before the events of chapter 5 - Ogre Battle: March of the Black Queen and chapter 6 - Ogre Battle 64: Person of Lordly Caliber. 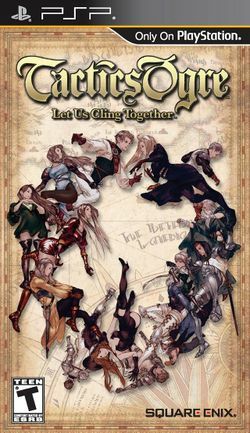 Chapter 7 - Let Us Cling Together is set after all of the above games. In the PlayStation/Super Famicom version the player must lead the "Liberation Army" to bring freedom to the oppressed nation of Valeria. The game was innovative in its branching plotline. Crucial decisions made in the game determine the path of the story, the members of your army and the ending sequence. There are multiple endings with radically different outcomes. Gargastan: While these people make up 70% of Valeria's total population, they suffer constant inner struggle between moderate and radical theorists on how government should best be handled. This weakens what would be a dominant majority. Walstanian: An oppressed minority of Southern Valeria, making up only 10% of the population. Their suffering is the catalyst to the plot in Tactics Ogre. Bacrumese: These are generally the more "elite" of Valerian society, making up a solid 20% of its people. King Roderick, aided by the forbidden powers of the "Hell Gate," is able to dominate the people of Valeria until Dolgare of Bacrum successfully leads his army to defeat Roderick. Dolgare then claimed the throne as his own, and was able to end the struggle between the ethnic groups. Under King Dolgare, the rights of the people were preserved, and all internal struggles in Valeria came to a temporary halt. All is right until the entire royal family is lost due to a string of accidents. Because the late King Dolgare had no living heirs, the ethnic groups once again struggled for leadership: Bishop Branta of the royal court, Cardinal Barbatos of the Gargastan people, and Duke Ronway of the Walstanians all fought for control, but in the end, Barbatos and Branta stalemated. In order to preserve their power, the two men took separate measures: Cardinal Barbatos sought an "ethnic cleansing" policy and slaughtered thousands of innocent Walstanians and Gargastans, while Branta received aid from the Roslolians, the greatest order in all of Lodis. The separation of the three races thus sets the stage for the beginning of the game. The player is greeted by a collage of scenes depicting the Roslolian Order's mysterious actions in Griate, hometown of Denim Powell, Kachua Powell, and Vice Bozeg, the main characters. This page was last edited on 16 June 2012, at 11:11. This page has been accessed 67,245 times.